Bears hibernate during the winter, but that doesn't work for dogs. Lack of exercise is just as bad for your pet as it is for you. Here are suggestions for some fun physical and mental activities your dog can enjoy without leaving your Springs luxury apartment home. Most dogs are as fascinated by bubbles as kids are, and they find chasing and popping them endlessly entertaining. Be sure to use a non-toxic brand of bubbles that won't harm your pet. You can even get a bacon-scented variety! Send your dog on a treasure hunt by carefully hiding treats and scented toys around the apartment. For a variation on this game, create an obstacle course he must navigate to reach his dinner. Add an additional twist by hiding the food in a KONG Wobbler or other interactive feeder. Work on Fido's doggie etiquette by training him to touch his nose to the back of your hand on command. This teaches him to focus on a target, and you can use his new-found skill to keep him under control once you get back outside. Distract your dog by tossing a treat, then hide somewhere in the apartment and call out to him. If you enlist a partner, you can take turns hiding while the other person handles the distraction part. This classic canine game works just as well indoors, as long as you clear any breakables out of the way first. If you live in a second-floor apartment, toss the item to be fetched from the top of the stairs to give Fido a more intense workout. Tug of war is another classic game that engages both you and your pet. Keep in mind that tug of war could stimulate your dog's natural predatory instincts, so you should have a well-established relationship of authority and trust before playing this game. Indulge in a bit of everyone's favorite bad-weather activity. Head to a nearby pet store and have fun strolling up and down the aisles. Agility training is like a fitness class for dogs. You assist your pet as he negotiates a challenging course including tunnels, teeter-totters, hurdles and weaving poles, working against the clock all the way. During the winter, there are usually days where the temperatures are brisk but not unbearable. The two of you can bundle up and enjoy some fresh air, but watch your dog's steps carefully to make sure he doesn't injure his paws or get too wet. When you and Fido are ready to hit the great outdoors, our off-leash dog parks are convenient places to play and socialize with other pets and humans. 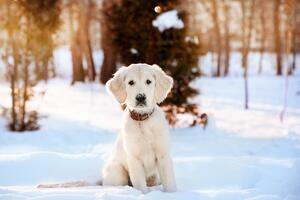 How do you keep your dog active during the winter? Let us know in the comments!